Villa Argento is located on the beautiful Monte Argentario. This modern and stunning villa with waterfront view is the ideal place to spend unforgettable and relaxing moments where time seems to stand still. Amongst nature, the turquoise sea, along with the beautiful and varied colored sunsets – one witnesses an everchanging spectacular every single day. The villa is unique and modern with a continuity between interior and exterior spaces. The property, with its three levels of construction, seems suspended above the sea. The villa is composed of a main house and five Suites. From the main gate after parking you can take the panoramic lift which connects you to the main house entrance and two suites. Otherwise using the stairway from the parking area you arrive at the pool area and then on to the main house. The third floor can be reached via a staircase where there are also two more suites. The open space living room of the Main House has a huge 10mt stained glass window that looks on to the sea. A transparent staircase connects the two floors. On the ground floor we find the living room, kitchen, large hall with fireplace and dining room, 2 double bedrooms, 2 bathrooms and one guest bathroom. On the second floor a master double bedroom with bathroom, living area with panoramic tower and a studio. The Suites: Suite 1- living room with dining area and kitchenette, 1 double bedroom, 1 single bedroom, 1 bathroom, and large patio facing the sea Suite 2 - living area, 1 double bedroom, 1 room with two beds, 1 bathroom, and large patio facing the sea Suite 3 - 1 double bedroom, 1 bathroom and hanging garden Suite 4 - living room with dining area, kitchen, 1 double bedroom, 1 bathroom, and large terrace Suite 5 - dépendance for two people with kitchenette and 1 bathroom All suites are independent and have private access to guarantee maximum privacy. 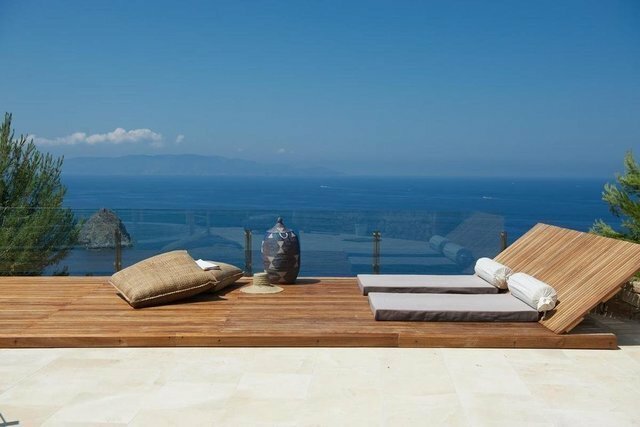 The terraces, patios and spaces which overlook the villa are splendid places to spend time relaxing, the infinity swimming pool 18mt. x 4 seems to continue into the horizon, and the sundeck seems suspended over the sea. Chef and wait staff can be organized on request to make your holiday just that much extra special. One is guaranteed a relaxing and luxurious holiday, surrounded by the best that nature can offer with access to all of modernity’s services.